ULK is the innovative 230V side gear motor for shutters without compensation springs up to 600 kg. ULK is completely MADE IN ITALY and with its robust and reliable steel gears guarantees excellent performance. 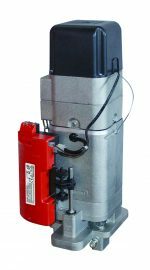 Practical: Simple and intuitive limit switch adjustment, Practical chain release for manually operating the door in the event of a power failure, external limit switch group and easily accessible.